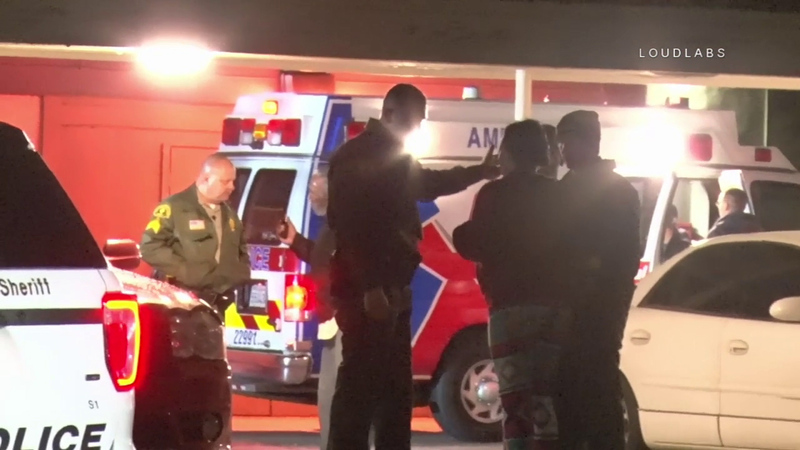 VICTORVILLE, Calif. (KABC) -- A 46-year-old man was arrested early Wednesday morning after he allegedly repeatedly stabbed another man and a woman who were staying at his Victorville apartment, authorities said. Deputies responded shortly after 3:30 a.m. to an apartment complex in the 14900 block of Arlette Drive, where they discovered the wounded victims, according to a statement from the Victorville Police Department. The 24-year-old woman and 21-year-old man, who were stabbed while they were sleeping, fled after the attack and went to a neighbor for help, investigators said. The deputies entered Jimmy Kendall Smith's apartment and "found him hiding in a closet, still in possession of the knife used in the stabbings," the news release said. When Smith refused to comply with commands, the deputies used "necessary force to detain him" authorities said. The two victims were airlifted to a trauma center in unknown condition. Smith was transported to a hospital by ambulance to be treated for his injuries, the statement said. He is expected to be booked for attempted murder upon his release from the medical center. Anyone with information about the investigation is asked to contact the Victorville Police Department at (760) 241-2911.